bi-elastic top layer; elastic in the length and in the width. Thanks to the bi-elasticity, the risk for skin tears, skin irritation or skin lesions when having a skin at risk diminishes significantly. 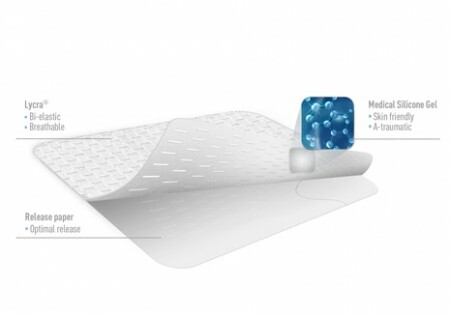 The wide scaled pore structure of the dressing allows the dressing to breath and supports an optimal wound healing based on the principle of moist wound healing. Reskin Silicone Skin Technology is integrated in a full range of innovative dressings, bandages and patches which are available in three market segments: medical professionals, at home ( OTC ) and sports.